Private Jet Charters – Is Traveling By Private Jet Out of Your Reach? You might think that traveling by private jet is just a dream that might never happen for you. You might feel that traveling in a small jet is just something that rock stars or rich Wall Street stockbrokers do and that the possibility of traveling in a Lear jet or one of the other models of small jets is just out of your reach. The good news is that these days private jet travel is becoming more affordable and more available to the general public than it has ever before. A short trip to a municipal airport or a little time spent watching air traffic will show you that the sheer number of small jets in the air these days is growing at a staggering number. Most people think that the number of very small jets in the air is an indicator of the number of really wealthy people in the country but the truth is that it is actually a sign of the changing airline industry. The shift towards the use of smaller jets for more travelers could be compared to the automobile industry in its infancy in many ways. There was a time when automobiles were simply too expensive to be owned by most people and only the rich and a few hobbyist owned automobiles. As motorized transportation grew and mass production helped to lower the prices of automobiles, travel by car came within the grasp of your average citizen. Likewise, only a few decades ago travel by airplane was reserved for the rich and famous and a flight on an airplane was almost akin to space travel today. As the commercial airline industry has grown though it has lost some of its charms, hasn’t it. These days a commercial airline flight is more like taking a bus than traveling in a way that was once reserved for the rich and famous. Commercial airlines with their poor customer service and shoddy business practices of canceling flights and overbooking flights have left many travelers with a bad taste in their mouths. This has opened the door for private jet charter companies to swoop in and provide a wanted service for those that are sick and tired of being treated like cattle. Now, as the jet charter industry has grown over the past few years as people have caught on that there are options open to them when it comes to air travel a strange thing has happened. Instead of the small jet charter companies growing the way the larger airlines did the jet charter companies have actually remained small and almost worked together to maximize availability and profits and provide top-notch service to their clients. By working together, jet charter companies and jet charter brokers have actually made travel by private jet more available to the general public at rates that are within the reach of many people just like you. By making their schedules available to each other these charter companies are able to take on passengers on empty leg trips and thus make a better profit for their hours flown. This means lower prices and more availability for people like you who are either looking to plan a trip for business or pleasure and as the popularity of travel by private jet grows so does the industry which causes prices to drop even further. This doesn’t mean that traveling in a small jet is necessarily “cheap” and you’re probably not going to find $49 fares out there but you might be surprised by the value that you get when traveling by private jet these days. 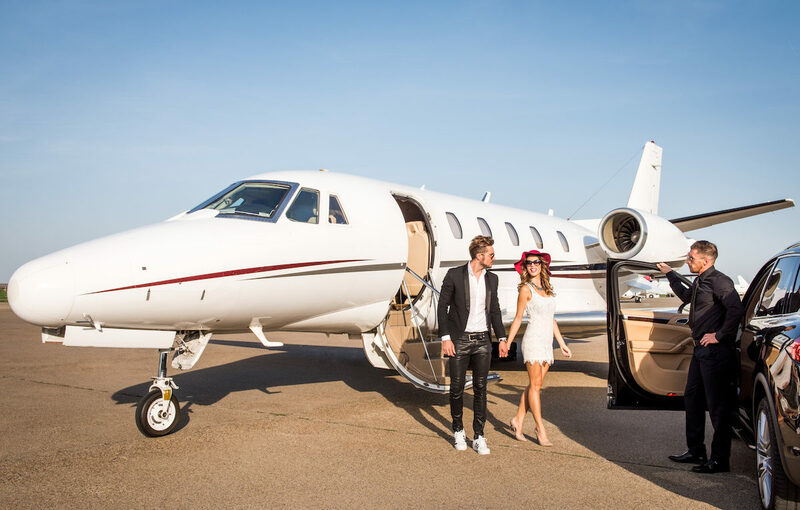 For a newlywed couple that wants to start off their new life together with a little style or a businessman that wants to impress a new client, there really is no price tag for the message that traveling in a private jet can send.